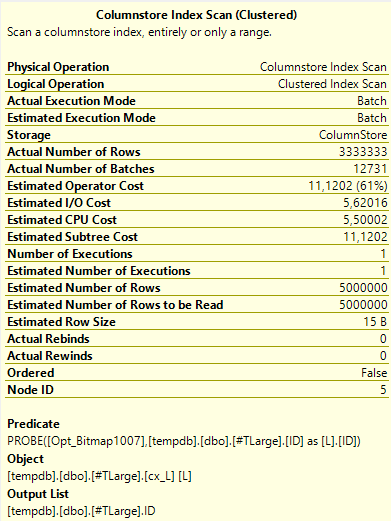 I was reading Paul White’s post about bitmaps in SQL Server and, other than realizing that I basically know nothing about anything (like a Socrate’s epiphany) I wanted to at least see how this good stuff added up in the latest 7 years. OPTION (MAXDOP 1); --CPU time = 12891 ms,  elapsed time = 13306 ms.
ON S.ID = L.ID; --CPU time = 11966 ms,  elapsed time = 1819 ms. The bitmap probe has been pushed down to the storage engine as an “IN ROW” predicate, meaning that the filter is pushed into the Storage Engine, and applied to rows as they are being read. I wonder what happens if I add some indexes? OPTION (MAXDOP 1); --CPU time = 5828 ms,  elapsed time = 5860 ms.
ON S.ID = L.ID; --CPU time = 8266 ms,  elapsed time = 1328 ms. It was able to skip a bunch of rows at the end when it realized that there couldn’t be any more matching rows from the 1st table but that’s it. The improvement on the parallel plan is sneakier, as the plan seems exactly the same at first, so how are we able to run even faster? We still aren’t seeking, but we still haven’t read all the rows, it’s 🌈MAGIC, even better, the magic of predicate pushdowns: In this case having an index on the column allowed to apply the bitmap filter even before the streaming of each row from memory, filtering out the pages that wouldn’t have contained a possibly matching row. ON S.ID = L.ID; --CPU time = 13016 ms,  elapsed time = 2236 ms. BEHOLD the Adaptive Join operator! But of course in the end it chose the Hash Match join, because we already know that we had too may rows for an inner loop join, but for some reason the optimizer didn’t consider the information that it already had before, weird. 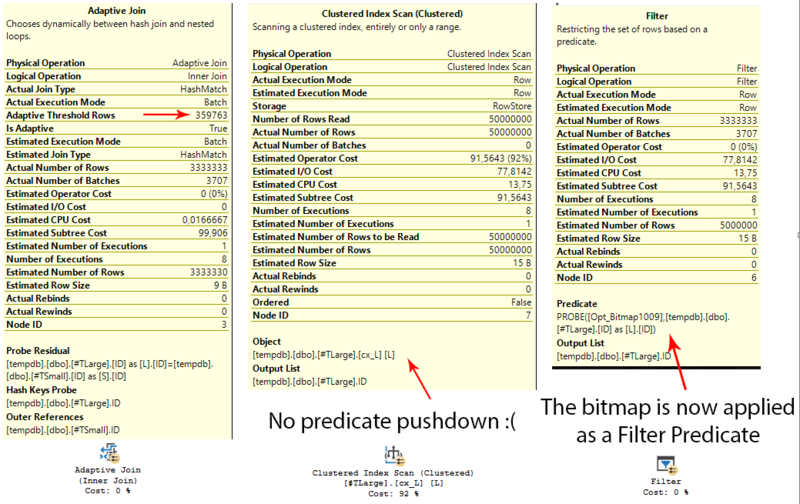 A bitmap is created regardless, but isn’t shown in the plan: it’s used a predicate for the filter operator. So, we switched to a batch mode join, which is super fast, but which is really only the residual probe of the Filter operator that was inserted in the new plan, and the scan needs to read all the rows in the table, regardless. The timing is good, but it’s worse than the plain parallel plan, leaving us with a “meh”. 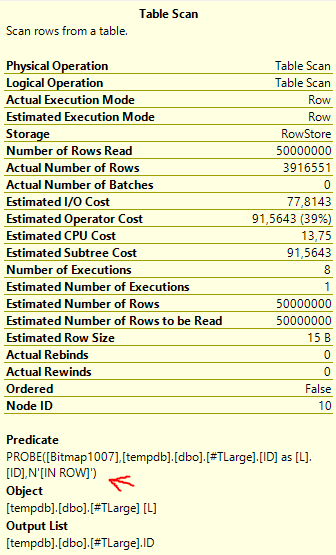 What if we put everything in Columnstore Indexes? OPTION (MAXDOP 1); --CPU time = 578 ms,  elapsed time = 589 ms.
ON S.ID = L.ID; --578 ms,  elapsed time = 591 ms. 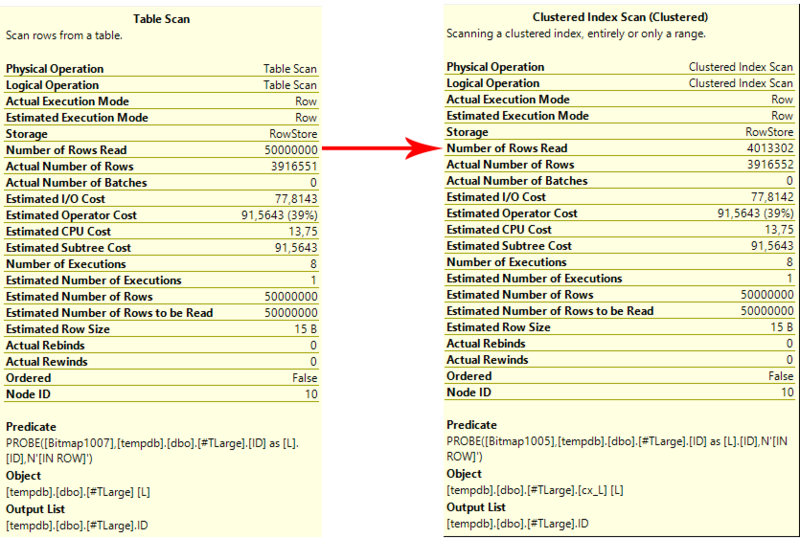 In this plan too, a bitmap is created and used as predicate for the scan operator, which of course runs in batch mode. It seems that for these type of queries the columnstore technology can’t be beaten!